I lost my best friend Rudy to cancer in January. She was a nine year old female GSD and was an amazing animal. 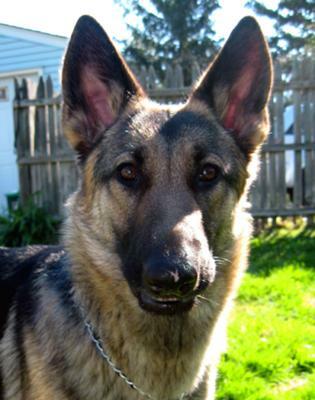 After a few months I discovered Shepherd's Hope, a GSD rescue that services the tri-state area. I saw Emily's picture and knew she could be my new dog. I went to meet her and brought her home a week later. She is about one year old and is beautiful. She is still a little anxious. She is great with people and loves children. She has some issues with dog aggression but we are working them out. She's very correctable and wants to learn and make me happy. She's very snuggly when she is tired. She has tons of energy so we've been walking a lot together which is good because we practice our leash manners and obedience training. I'd like to thank Shepherd's Hope and Total GSD for helping me find Emily and giving me great tips on how to make her more comfortable in her new home. Total German Shepherd: Thanks, KI. Glad we could help. And thanks to you also for rescuing her in the first place! Emily is gorgeous, BTW. Keep the pictures coming if you get the chance - we'd love to share them. :~> Thanks so much for taking the time to come here and share your German Shepherd puppy story and pictures with us all today too. I love to hear a story where an animal who is in dire need of a supportive home is rescue! If only more folks would adopt instead of purchasing from these puppy-mills! I'm glad you found each other and may the years ahead bring you trails of happiness, laughter and bones!